As you may know, I'm a fan of “do-it-yourself” when it comes to the kitchen. Making your own food products is a great way to supplement your pantry, and can be cheaper than buying them ready made. It's easier than you might think. In keeping with the kitchen DIY spirit, I decided to take on candied ginger. Candied ginger has three ingredients: ginger, sugar, and water. There are many recipes out there; I just happen to like this one. The advantages of making your own candied ginger are many. It tastes better than the supermarket stuff, for starters. In addition, the byproduct of making it is ginger syrup – a miraculous food stuff all on its own. Bonus! Candied ginger can be added to so many things, cookies, cakes, sweet potatoes, pumpkin pies … the list is long and illustrious. I've been told it's good for you, too. It's an old cure for nausea and seems to reduce gastric inflammation. Some people say it even has a positive effect on some cancers. I just like snacking on it. It's pungent, sweet, spicy, and really kicks your taste in the buds. Ginger syrup is wonderful. Use it to sweeten teas (herbal in my case), or kick up cold drink – think mock ginger ale, ginger lemon-lime soda, or ginger cola. Pour it over pound cake instead of some other syrup or glaze. I like it on vanilla ice cream. Note: Young, fresh ginger root is preferred because it's got a milder flavor and is more tender. The older ginger will work just fine, though. Break the fingers of ginger apart, and peel them. You can use a vegetable peeler, but it easier to get around the knobbly bits by scraping it off with a spoon. Cut the peeled ginger into thin slices. Place the wire cooling racks inside a rimmed baking sheet and set aside. Combine 2 cups of the sugar and water in a medium saucepan over medium heat. Bring it to a simmer, stirring occasionally, until the sugar dissolves and it looks clear. Stir in the ginger slices. Reduce the heat to medium low and simmer until the ginger is tender and translucent, stirring occasionally, about 45 minutes. Drain the ginger using a strainer set over a large bowl to collect the syrup. Set the syrup aside to let it cool. Transfer the ginger to the cooling rack. Spread the ginger pieces out a bit, so they don't touch each other. Let the ginger dry until it's no longer moist, but still a little tacky. This will take at least 6 hours, but should be done in no more than 12 hours. Combine the dried ginger and the remaining ¼ cup of sugar in a large bowl, and toss until well coated. You'll have some sugar left over, that's okay. You can use it to sweeten your drinks or something. This is where your patience will pay off. If you don't wait until the ginger is dry before you toss it with the additional sugar, you'll end up with gummy ginger pieces that will cement themselves together. 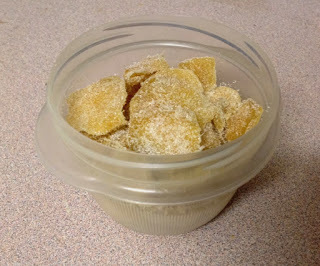 Candied ginger can be stored in an airtight container at room temperature for about 2 weeks. Once the syrup is cooled, transfer to a jar and refrigerate. Makes about ¾ cup of candied ginger, and about 2 cups of ginger syrup. The joy of cooking aside, is it worth the cost and time? I have no idea how much electricity or natural gas this takes, so I can't account for that. Just keep it in mind as you read my cost breakdown. The cheapest I found for a 16 oz bag of “crystallized ginger” was $4.99, or about 30 cents an ounce. From what I've been able to figure, there's about 6 oz of candied ginger per cup, so the yield of this recipe it about 4.5 oz. 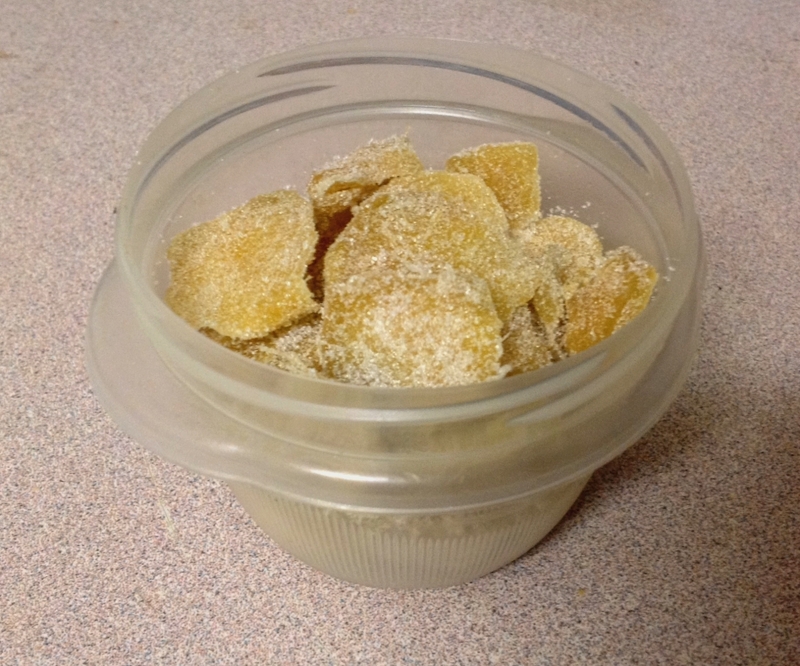 Commercially, that's about $1.40 worth of candied ginger. Keep in mind that this candied ginger isn't very chew-able. The more tender stuff, which is comparable with the candied ginger in this recipe, goes for as much as $11.99 a pound, or 75 cents per ounce. Compared to that product, making your own candied ginger comes in at about $2.53 worth of candied ginger. Ginger root, at my local grocery, is $3.69 per pound, or 23 cents per oz. This recipe uses 8 oz of ginger, so that's $1.84. A 4 pound bag of sugar costs $1.50. At 2 cups of sugar per pound, that's about 38 cents worth of sugar. The total cost for the ingredients, then, is $2.22. Remember, that doesn't count the cost of heat or your time. It seems to only be cost effective if we're comparing it with the “good stuff.” With the added cost of heat and time, we're lucky to break even, so far. Except we also get 2 cups of ginger syrup out of the bargain. Just like commercial candied ginger, the price of ginger syrup varies widely with the quality. Some of these syrups have all kinds of added preservatives and stabilizers and artificial flavors. I found the cost of ginger syrup varying from about 25 cents per oz, for the cheap stuff, to about $1.50 per oz, for the good stuff. At 16 oz, that means anywhere between $4.00 and $24.00 worth of ginger syrup. We get it for free, as a byproduct. Okay, so at its lowest commercial cost, we're making at least $6.22 worth of gingery goodness for $2.22, plus the cost of the heat and time. That's a bit less than $4 savings, and that's comparing it to the cheap stuff. At best, we're making about $26.00 worth of product, that's a $20.00 savings. I don't think we're actually saving that much, but it suddenly seems a lot more cost effective to make it ourselves. Apple Butter, or Apple Awesome Sauce? When the apples go on sale, I like to take advantage of the pricing and get bunch of them. The problem is, I know they'll go bad before the family eats them all. I could make pie, but what if there's still a lot left? Make apple butter, of course. For those who don't know, apple butter is not a fruit filled dairy product. It's more like caramelized applesauce. But it's really not applesauce, either. 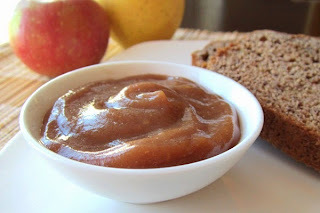 I've tried several recipes for apple butter, a couple of which used a crock pot. They weren't bad, but they left me wanting. I'm a fan of using a crock pot for apple butter, because it really does take a good deal of time to make it, but I didn't want to lock myself into a particular appliance without trying out a few other methods. As a foodie, I'm always after the good stuff. Some recipes I tried used a little spice, cinnamon, ginger, clove, and so on. Some used so much that they ended up tasting more like a spicy slurry, with little to no apple flavor. Others weren't so bad, but I wanted something that celebrated the apple, no spice needed. Eventually I tried one recipe from America's Test Kitchen. I'm a huge fan of theirs, as some of you may know, but sometimes their recipes don't work well for my situation. In this case, a couple of minor tweaks gave me an apple butter that had deep, rich, apple flavor, well beyond the other recipes I'd made. Sweet, but not too sweet, full of apple goodness, with nothing to get in the way. Best of all, it works for the kitchen I have, and uses affordable apples varieties. There are several apple varieties that work well for apple butter, and a few that you'll want to stay away from. Even though you'll be cooking these apples until they break down, you don't want their flavors to break down along the way, or the resulting product become too watery. Varieties that hold up well to cooking, such as Fuji, Gala, and Granny Smith, are the way to go. Use two or three different varieties of cooking apples for the riches flavor. Stay away from Red Delicious or Golden Delicious apples. They're great for eating raw, but they don't hold up well under heat. 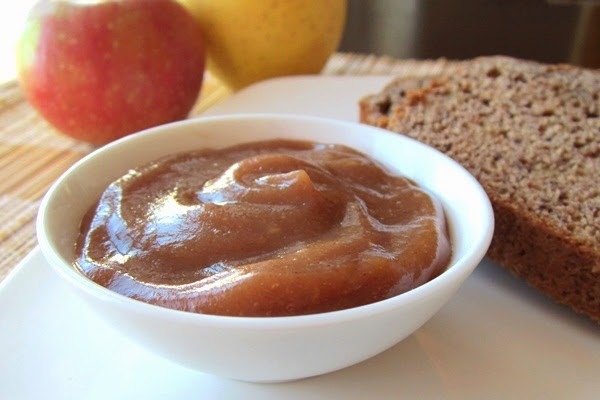 Apple butter is wonderful on just about everything you might put jam or applesauce on. I like it on toast, topping cottage cheese, or mixed into plain yogurt, when I'm not eating strait out of the jar, that is. It's super tasty as a topping for vanilla ice cream, as well. Wash and then core the apples; chop them into 2-inch pieces. Don't bother peeling them. The oils in the peel with deepen the flavor. Put the cut apples into a large cooking pot, along with the apple juice, over medium high heat. Once it reaches a simmer, reduce the heat to medium low, cover, and simmer until the apples are very soft, stirring two or three times while cooking, about 30 minutes. Remove from the heat and use an immersion blender to break up the apples, until very smooth. You can use a regular blender or food processor if you don't have an immersion blender. Just do it in batches and be careful. The apples are very hot. Alternately, you can run them through a food mill, eliminating the next step. I don't have a food mill, they're a little pricey, so I need to use the next step. Putting the fine mesh sieve over a large bowl, pour the apple mixture in, a little at a time, and push it through the mesh with a flexible spatula. This will remove the peels and make the mixture silky. Discard the peels. Pour the apples back into the empty cooking pot. Mix in the granulated sugar, brown sugar, lemon juice, and salt. Heat the pot over medium high until it comes to a simmer. Reduce the heat to medium low, cover, and simmer until the mixture becomes thick, like loose jam, about 1 ½ hours. Let the mixture cool completely before transferring to pint jars or plastic freezer containers. It can be kept in the refrigerator for a couple of weeks, or in the freezer for a few months. The classic American meal, as I recall it, consists of an entree, and two side dishes - one starch, one veggie. Once you get tired of mashed potatoes or bread for the starchy side, though, you start to come around to rice. Rice is a great grain. I love it and so do millions of other people, worldwide. Rice can be a little bland by itself, though. In our case, we're going to kick up the rice's flavor by adding a few herbs to make a fluffy, savory, side dish. 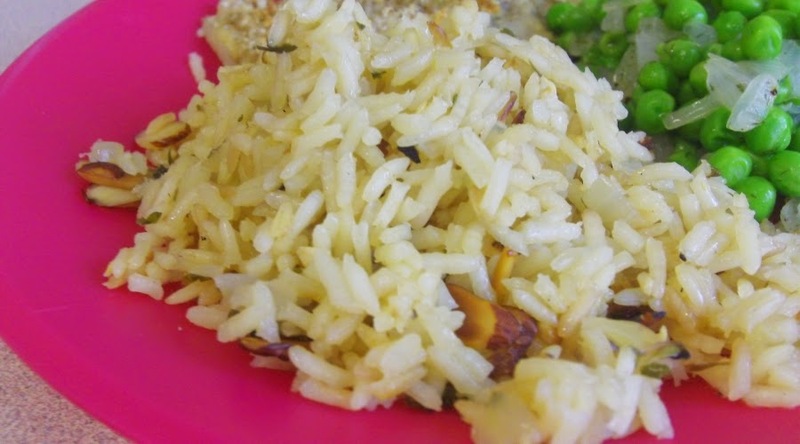 Traditionally, a pilaf is a rice dish cooked in broth and seasoned with herbs and spices. Not all pilafs are the same. It's origins are in the middle east, but variations can be found throughout east Africa, as well as central and southern Asia. Pilafs vary as widely as the cultures it came from, and the cultures where it spread, which is just about everywhere. Some people add meat and veggies, but that goes beyond what we're going to do with, here. For me, it's all about fluffy rice with herb-packed goodness. Don't think for a minute you have to use the herbs I've listed. Try a few spices, while you're at it. Is the entree turkey with sage? Tie it together by adding sage. BBQ Chicken? Spice it up with paprika and a pinch of cayenne. Play around and make it your own. Note: I've indicated dried thyme and parsley, because that's what I normally have on hand. You can substitute 1 teaspoon of freshly minced thyme, if you'd like. If you don't have fresh parsley on hand, you can used dried parsley. Add it along with the thyme before cooking the rice, though, or it won't give up it's flavor as well. ¼ cup fresh, chopped parsley. Toast the almonds in a dry, non-stick skillet over medium heat until fragrant and toasty, about 4 minutes. Keep them moving so they don't burn. Remove from the heat and transfer them to a plate to cool. Melt the butter in a medium to large saucepan over medium-high heat. At the onion and a pinch of salt. Cook until just softened, about 3 minutes. Add the rice and cook, stirring frequently, until the edges start to turn translucent, about 2 minutes. This denatures the starches and helps the rice stay fluffy, not sticky. Add the garlic, thyme, bay leaf, and dried parsley. Cook, stirring constantly, until fragrant, about 30 seconds. Stir in the chicken broth and bring the mixture to a boil. Cover, reducing the heat to low, and cook until most of the liquid is absorbed and the rice is tender, about 20 minutes. Remove from the heat and let it stand, covered, for 10 minutes more. Discard the bay leaf and fluff with a fork. Stir in the almonds and fresh parsley, if using. Season with salt and black pepper to taste.